How wonderful........they are darling and practical....I love the shark with the teeth!! I love those teeth too! I used pinking shears for that! These were fun to make!! Thanks bunches!! They look great. Hope they do stop sticky fingers wouldn't want you goodies to get marked. They are vinyl -so they could be wiped off! Thank you! Vivian is 5 and she loves everything I stitch!! Five year olds are not very fussy!! Thanks! Thank you so much Sonja - I can't claim the designs - as I purchased them. Fun to see out!! Those are very cute! I think they could also be used as pencil toppers. Thank you so much!! I bet they could!! Of course, I would be happy to - if you would private message me. the INBOX with the red circle is where you can message me. Click on it and message dailylaundry. Thank you! 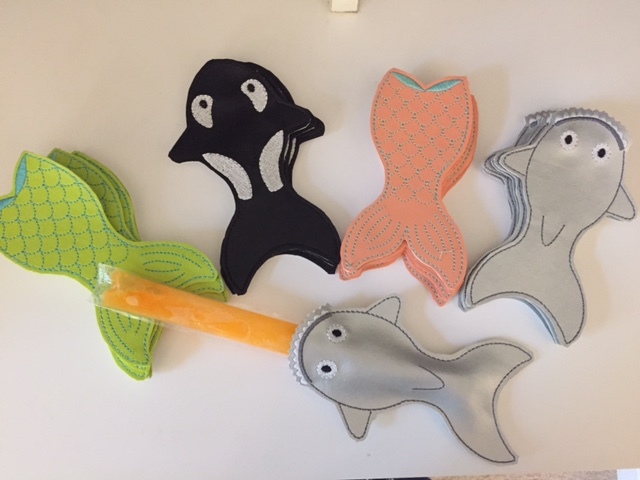 If they buy a holder - they get a popsicle for free - and, even if they don't buy one - they can have a popsicle!!! We will bring lots in a small cooler! Thanks!!! I am sure these will be gone quickly. Even though it is cooler here now, I would want one! I have to admit - the popsicle in the picture was very tempting (and it is 43 degrees F. here!) Thank you!! These are just darling and the Moms and Dads will love them as much as the kiddos. Laura, If you don't know, I'm from the south and although I wrote darling, my southern brain said, "darlin'". I was raised in Florida and lived in Mobile, Alabama for 14 years. I understand "darlin"!!!! Thank you!!! These are sew cute and handy! They are kinda cute. We are going to try to hand out Popsicle with them! What a wonderful idea Laura, practical and beautiful, love them! This is a great idea and also cute. Hope you will have a great success. Thanks! It was an easy and fun project! Thank you - thank you!!! And welcome to Cute!!! So cute and practical too. I wish you success with your booth. Great idea to use these to introduce your goods. This will be a small neighborhood craft fair - so I don't expect a lot of people. But, at least I feel prepared. Thank you Karen!